The Gaia-ESO Survey is a public spectroscopic survey. 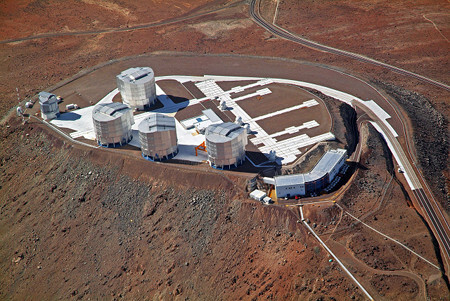 It uses the FLAMES instrument on the Very Large Telescope (VLT-UT2) to take spectra of about 100,000 stars. It systematically covers all the major components of our Milky Way: the Thick and Thin Disk, the Bulge, the Halo, and a large number of Open Clusters. It thus provides the first homogeneous overview of the distributions of kinematics and elemental abundances. The project is led by Gerry Gilmore (Cambridge, UK) and Sofia Randich (Acetri, Italy), and it was awarded 300 nights of observing time (spread over 5 years). There are approximately 450 Co-Investigators in the Gaia-ESO Survey. Among them are five ROB persons: Ronny Blomme, Yves Frémat, Alex Lobel, Martin Groenewegen, and Delia Volpi. The management structure of the project consists of 20 Working Groups. Ronny Blomme leads the Working Group WG13 “OBA Star Spectrum Analyses”. Within this working group, there are a number of international groups that analyse all, or part of, the spectra of the hottest stars (those with spectral type O, B and A). They do so by comparing theoretical spectra to the observed ones. They change the parameters of these theoretical spectra till they obtain a good fit with the observed spectrum. In this way, the stellar parameters and abundances of each star are determined. 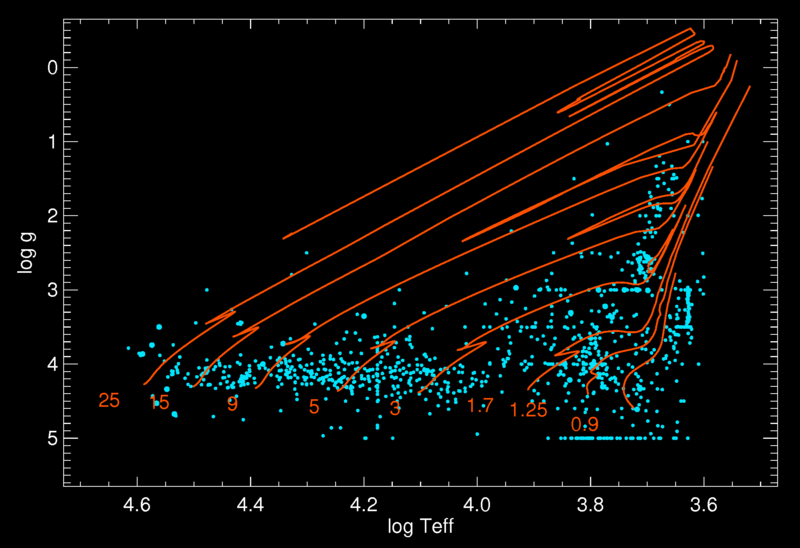 The so-called Kiel diagram of the Gaia-ESO Survey data for the Carina region. It plots the gravity (log g) against the effective temperature (Teff). 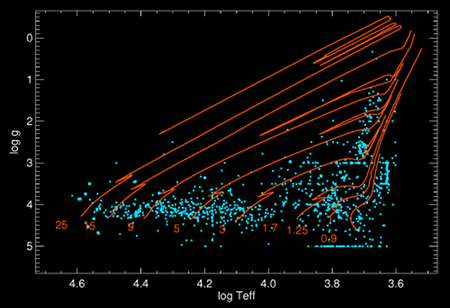 Each small blue symbol is a star that has been analysed by WG13. Evolutionary tracks are plotted in red, and they are labelled with their initial mass. One of the many areas in which the Gaia-ESO Survey contributes is the study of "stellar streams". Our Milky Way, like other galaxies, was formed by accreting various smaller groups of stars, such as small galaxies. As these small galaxies pass close to our Milky Way, they get tidally torn apart and end up as streams of stars stretched out over a large part of the sky. But they can still be recognized by a careful analysis of their velocities and their chemical composition. And that is where the large number of spectra collected by the Gaia-ESO Survey comes in. More information about the Gaia-ESO Survey can be found at www.gaia-eso.eu.